Easy Paleo & Vegan 3 Ingredient Peppermint Chocolate Mousse – creamy, luscious, and decadent. 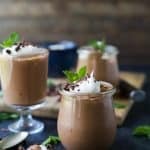 This Chocolate Mousse is absolutely perfect for the holidays! Add chocolate to a medium microwave safe bowl. Melt chocolate in 30 seconds increments until smooth. Stirring throughout. Once the chocolate is melted, pour in the coconut milk (or cream) and peppermint oil. Using a whisk, mix the ingredients together until they are smooth and completely combined. Cover with plastic wrap and place in the refrigerator for 3-4 hours. Remove from refrigerator. Using a hand mixer, blend on low to medium speed to fluff up the mousse. Portion out in small serving glasses or ramekins.